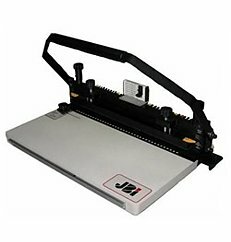 The PB21SP Manual Punch and Bind Machine is a low cost binding system that gives its users the ability to create books in the Wire-O style. This machine punches 2:1″ pitch round holes for thicker Double-O / Wire-O® documents from 5/8″ to 1-1/8″ and closes all wire sizes from 1/4″ to 1-1/4″. The PB21SP has 26 fully selectable 2:1 pitch punch pins and an open binding edge up to 13 inches for maximum punching flexibility. In order to use the standard punch pattern or customize your punch hole pattern all you have to do is simply pull a punch pin lever to disable punching. The PB21SP features a D-shaped handle for users that are either left handed or right handed, or you could use both hands at the same time for maximum productivity. The wire hangers of the PB21SP are located at the front of the machine that holds your document in place for fast and effortless insertion and document construction, which makes using this punch and bind machine easy and more convenient than most other machines. If you have any questions or are interested in purchasing the PB21SP Punch and Bind Machine, visit us at SpiralBinding.com. We have great pricing on a full line of Desktop Punch and Bind Equipment. Call us at 1-800-631-3572 for more information!